A powerful anti-inflammatory and traditional digestive aid. Along with cinnamon and turmeric, ginger is one of the three best-known spices in the world, known as much for the flavour they bring to cooking as for their health benefits. Ginger grows wild in tropical climates. Part of the Zingiberaceae family, the root is used as a spice in sweet and savoury dishes. Its principal components – gingerols (including 6-gingerol) and shogaols – are what gives ginger its smell, taste and activity. Super Gingerols is an extract of ginger (Zingiber officinale) standardised to 20% gingerols which have multiple properties. It is traditionally used for digestive problems (upset stomach following a fatty meal) and especially for acid reflux. Indeed it is just as effective for this as the commonly-prescribed proton pump inhibitor (PPI) drugs but does not have the latter’s long-term side-effects. In such cases, it is beneficial to combine it with Mastic Gum. A long-established and effective anti-nausea agent, it relieves nausea in pregnant women, post-operative patients and those undergoing chemotherapy. Studies on people with osteoarthritic pain (in the knees and hips, in particular) show it has important anti-inflammatory properties which allow lower doses of NSAIDs to be administered. Indeed, ginger’s active substances may inhibit the pro-inflammatory enzymes Cox1, Cox2 and lipoxygenase. In addition, taken at a dose of two capsules a day for three consecutive days, it is just as effective as these drugs for relieving menstrual pain (dysmenorrhea). It lowers glycaemia levels and reduces post-prandial spikes in blood glucose. It is therefore recommended for diabetics and those with pre-diabetes. Indeed, a recent study showed that it led to decreases of more than 12% in blood glucose and more than 10% in glycated haemoglobin (HbA1c), a measure indicating the three-month average glucose concentration. It also lowers LDL-cholesterol. One study showed it reduced oxidised lipoproteins by 28% as well as the ApoB/Apo A-1 ratio, both specific markers of risk of cardiovascular disease. Supplementing with ginger is also associated with other health benefits, though further studies are needed to confirm these effects: it may improve and protect mental faculties and brain function, including among individuals presenting with Alzheimer’s-related problems. In such cases, patients are advised to take a combination of Super Gingerols and Bacopa monnieri as soon as the first symptoms appear. 6-gingerol may also have ‘anti-cancer’ properties, particularly for adenocarcinoma of the colon but potentially also for pancreatic, bronchial and ovarian cancer. 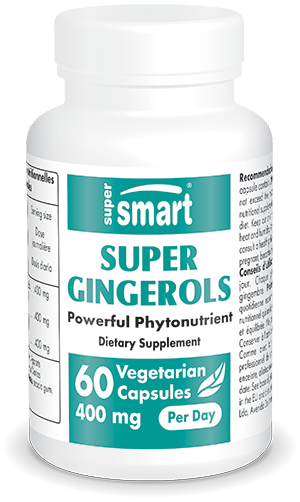 Super Gingerols is thus a simple, natural and safe supplement. It is one of those basic nutritional supplements you should always have in your ‘first-aid kit’ for relieving joint or muscle pain, nausea, and temporary digestive problems, as well as for maintaining long-term, optimal health. Super Gingerols is purposely not combined with cinnamon in order to avoid possible interactions in sensitive individuals. Each capsule contains 200 mg of extract of ginger.